Classic Egg Salad is the PERFECT lunch, made with seasoned mayonnaise, mustard, celery, and red onion mixed with hard boiled eggs. 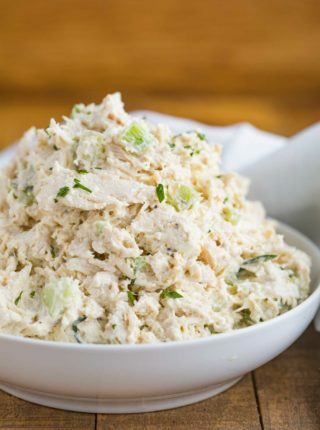 We love quick and easy lunch recipes like this Classic Tuna Salad, Classic Chicken Salad, and Creamy Shrimp Salad! 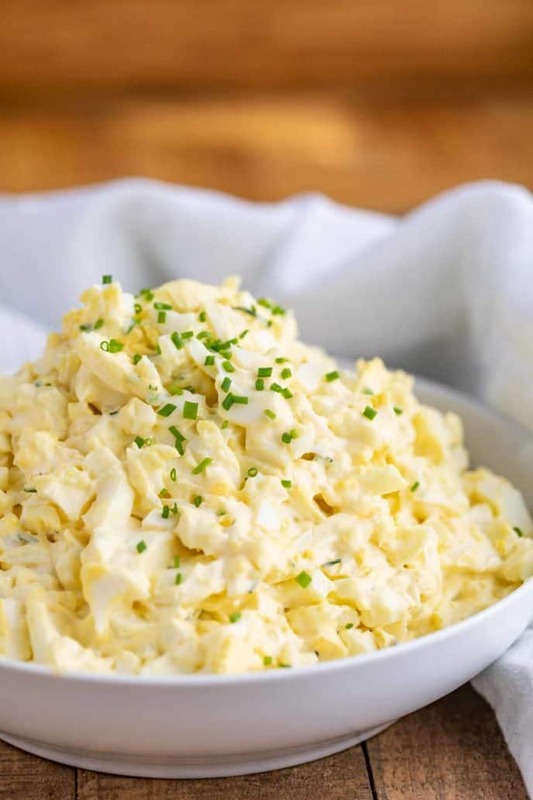 Classic Egg Salad is the PERFECT recipe for a quick lunch or as a side dish at a picnic, made with hard boiled eggs, mayonnaise, mustard, veggies, and seasoning. You can make this egg salad recipe ahead of time and eat all week, or serve over a salad for dinner. If I serve this on salad, I usually top with extra green onions or chives for presentation. This recipe takes a total time of 25 minutes to make, but I like to cool this in the refrigerator for at least an hour before serving. You can also serve this egg salad recipe on a sandwich using my classic white bread. Trust me, you’ll never want to go back to store-bought again! 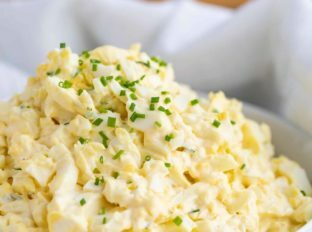 HOW MUCH EGG SALAD SHOULD YOU MAKE PER PERSON? If you’re serving this to guests for lunch, I like to make at least 1/2 cup of egg salad (or about 2 eggs) per person. If you’re serving this on egg salad sandwiches, I’d also put out a plate with extra tomato slices and lettuce. Make sure you toast the bread and assemble the sandwiches just before serving, so the bread doesn’t get soggy. 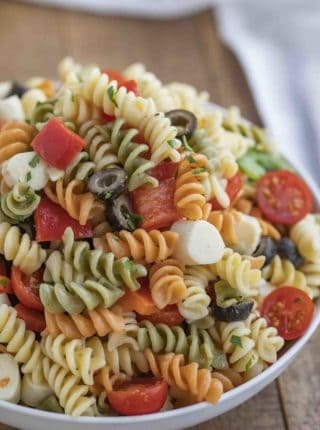 You can also just serve this on a tray with extra pieces of celery, carrots, and lettuce so guests can make their own plates or salads, as a lower carb option to sandwiches. WHAT ELSE CAN YOU PUT IN THIS CLASSIC EGG SALAD RECIPE? If your egg salad turns out too runny, you can add more chopped hard boiled eggs to the mix. You can also put the egg salad back into the refrigerator as the cold can help firm up the mayonnaise, and stir before serving. 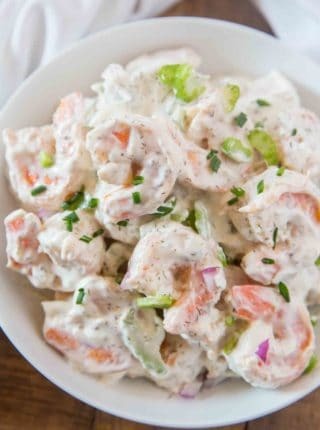 To help prevent runny egg salad, wait to add the celery or tomato until just before serving, because both of these veggies contain a lot of water. Peel the eggs right after they come out of the ice bath, otherwise it might be difficult to get the shell off. Salt the water when you’re boiling the eggs, which helps them peel easily when they’re done. 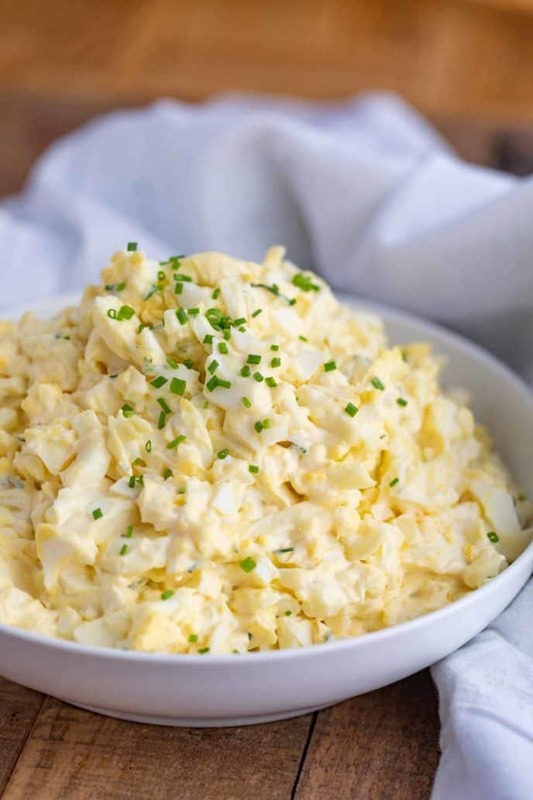 Egg salad will last in the refrigerator for 3-4 days, stored in an airtight container. Assemble sandwiches just before serving, instead of storing fully made, or the bread may fall apart. Lighten up the calories in this recipe by using light mayonnaise and egg whites. You can also sub the mayonnaise for plain Greek yogurt. If you’re adding pickles or relish add them just before serving, and drain completely before adding to avoid making the egg salad watery. Add a dash of cayenne pepper, curry powder, dill, or paprika to the egg salad to add some spice and flavor. I also like to use dijon mustard instead of yellow mustard because it adds a deeper flavor. Use leftover deviled eggs or easter eggs to make egg salad, using slightly less mayo to compensate for what’s already in the deviled eggs. Serve as an egg salad sandwich, over slices of tomato, on salad greens, or in a wrap. Or just eat it by itself! Classic Egg Salad is the PERFECT lunch, made with seasoned mayonnaise, mustard, celery, and red onion mixed with hard boiled eggs, plus it's easy to make! Chop the eggs then add in the rest of the ingredients and mix well, refrigerating for at least 1 hour before serving. I’ve learned the best way to contact hard boiled eggs! You bring water to a boil first, then lower the egg into the pot, cook for 12 minutes on low heat. You don’t need to add anything to the water or so anything special to prep the eggs, by putting them straight into boiling water, you don’t give the inner membrane time to bond with the Shell during the heat up period. The peel comes right off! Make sure they are completely submerged in the water and use the lid. If you don’t need to make many, I’ve started using an old fashioned steamer basket which holds about 5 eggs at a time, just lower the basket in and no issues with cracking etc. Perfect! I can’t ever turn down a classic recipe like this! Tasty and full of the flavors we love! So glad you all enjoyed it, Noelle! It’s hard to beat the classic recipe, isn’t it? I know there are many different ways to vary it up, but I always find myself going back to the original egg salad recipe. I love it. I’m DREAMING of picnic weather on this cold, soon-to-be snowy day, so I’m thinking this dish will be perfect to help me pretend. A girl can dream! Yes, picnic in the living room! 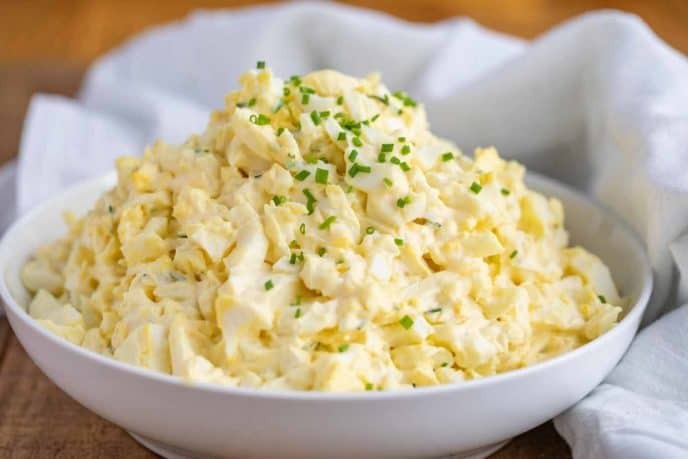 Egg salad is one of my favorite lunches. I like it on sandwiches and also on top of greens. This recipe looks spot on! Egg Salad sandwiches are always a hit with my family. The key is to use a good quality mayo, none of that ‘salad dressing’ stuff for us. I like a small squirt of lemon juice, but I never add vinegar. I will, however, try adding tarragon the next time I make it….sounds interesting. Sometimes I substitute celery salt for regular salt. It adds incredible flavor! Also, a sprinkle or two of dried parsley flakes adds color & more flavor. We like our Egg Salad sandwiches on lightly toasted whole grain bread with Bibb (Boston) lettuce. 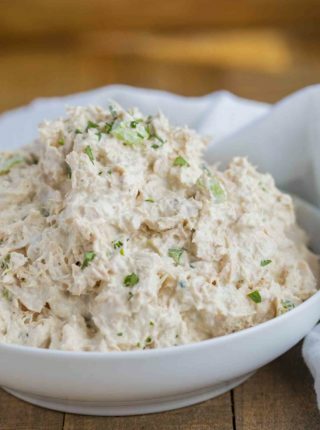 (Egg Salad, Tuna Salad, Shrimp or Lobster Salad….my family LOVES these delicious cold sandwiches on a hot & busy summer day).